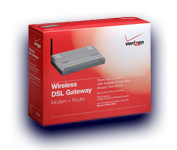 * NOTE: If you are a QWEST customer looking for a "STARTER KIT" and the store you visit is out of stock, please know that the "Verizon Starter Kit" WILL work for you as well. *ALSO NOTE: If you click on a link above and have trouble finding the correct hardware or the link has expired, simply use the web site you are trying to link to (i.e. 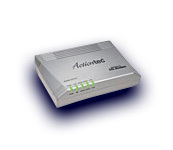 BestBuy.com) and use that site's SEARCH feature to look-up "ActionTec DSL"
U.S.Robotics USR5610B 56K* V.92 Performance Pro Modem is Controller-based for superior performance. It is compatible with a number of operating systems including DOS, Linux, and Windows. ( click here for more details ). 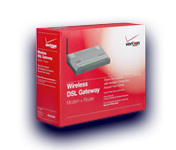 U.S.Robotics USR5686E 56K* V.92 External Faxmodem - This works well connected to a single computer, or used in conjunction with the U.S.Robotics USR8000A Router to share an internet connection with multiple computers. NETGEAR FVS338 PROSAFE� VPN FIREWALL 50 W/8 PORT 10/100 SWITCH AND DIAL BACK-UP - NETGEAR�s ProSafe VPN Firewall 50 with Dial Back-up is a SNMP-Manageable, high-performance network solution that furnishes multidimensional security. 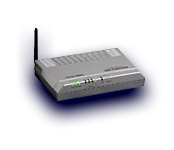 Fully equipped and broadband-capable, this Virtual Private Network (VPN) firewall comes with connection insurance: a built-in serial port for dial-up access. This practical feature means your business can maintain operation if your broadband Internet connection fails. It lets you retain an analog modem for emergency backup and also provides a migration path from analog to broadband, making the transition effortless.